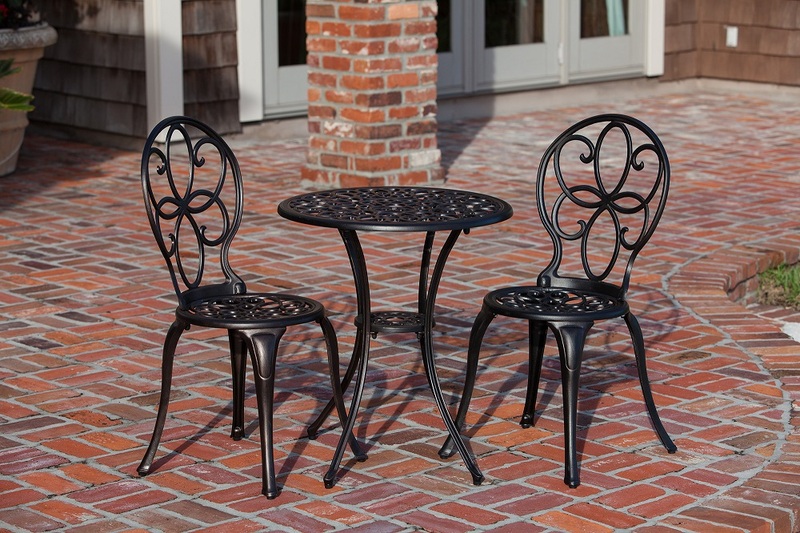 Adding elegance and refined detail to your backyard is easy with cast aluminum furniture. Cast aluminum patio furniture is made by a careful process that includes pouring molten aluminum into specially designed molds. This technique allows for a high level of consistency, along with more intricate and detailed designs than other materials have to offer. Cast aluminum is also usually equipped with a powder-coated finish, which is permanently baked on and enhances the furniture’s scratch resistance. The most popular color is black, but cast aluminum also comes in a variety of other colors. If you’re looking for more of an antique look, cast aluminum can be artificially aged by choosing a bronze or faded paint texture. Going without cushions gives your cast aluminum patio furniture a simple and elegant look perfect for bright green gardens blooming with colorful flowers. Adding cushions gives extra comfort and incorporates a pop of color into your patio furniture set. Cast aluminum doesn’t rust. Ever. It’s the perfect material for patio furniture in damp climates. You can even leave it out in the rain or snow without any ill effects. It also does well in hot weather, absorbing less heat compared to wrought iron furniture. When it’s time to clean your cast aluminum patio set, just spray it with water from a garden hose to remove cobwebs and loose dirt. Wipe up more stubborn or sticky residue with a sponge dipped in warm soapy water. You don’t have to worry about damaging cast aluminum when you clean it using these simple techniques. 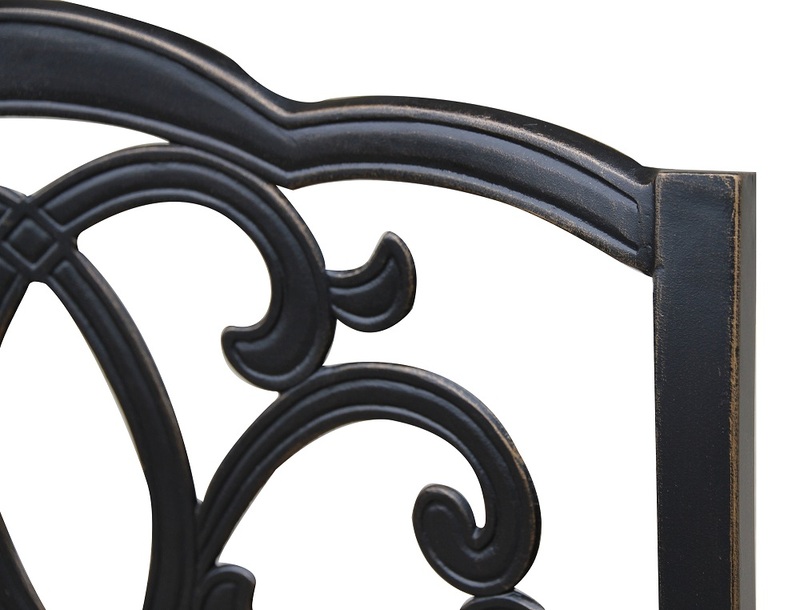 A piece of patio furniture made from cast aluminum is essentially a solid piece of metal. While it does mean this type of patio furniture is heavier than other options like plastic, it also means it won’t bend or warp. This type of patio furniture also rarely experiences any noticeable wear. Because of this, cast aluminum furniture can last upwards of 20 years. The material’s weight also means that your patio furniture won’t wear out over time or blow away in the wind. Plus, it’s still light enough to move around and lift easily, unlike heavier cast iron furniture. Despite being one of the most durable and resilient materials for outdoor patio furniture, cast aluminum is still totally affordable. On par or costing less than other material options, you can find cast aluminum bistro sets and garden benches for under $200. You can also find larger sets of cast aluminum furniture, including a few chairs and cushions, in the $500 to $600 range. Considering the amount of wear that other types of patio furniture endure, plus the need to store them during the winter, cast aluminum is, by comparison, a very straightforward and simple option for furnishing your patio. What materials are you looking at for your next patio furniture set? Browse our selection of stunning Outdoor Furniture here. Find the right look for your patio.